■ Remove any existing moisture from the fuse box using a dry cloth. ■ To open: open clamps 2. ■ Fold up cover 1 in the direction of the arrow and remove it. ■ To close: check whether the seal is seated correctly in cover 1. ■ Insert cover 1 at the side of the fuse box into the retainers. 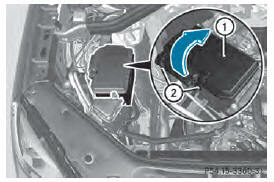 ■ Fold down cover 1 and close clamps 2.